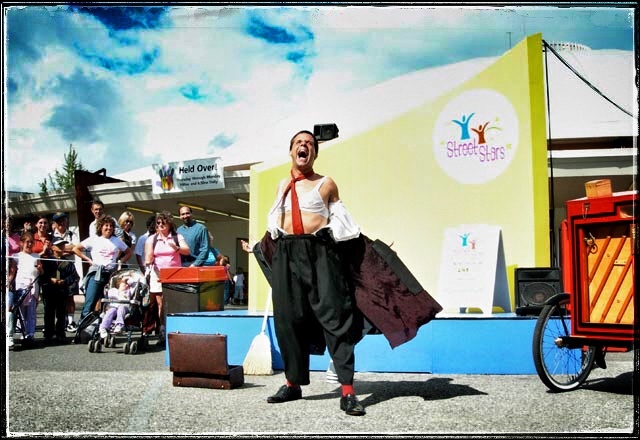 This episode is proudly sponsored by Dolphin Creative – a company who is proud to support street theatre and all of the incredible characters who make up this world. Where ever you perform: Dolphin Creative salutes you! For more information please visit DolphinCreative.org – Huge thanks to Stuart and his team for sponsoring this episode and two more to come! 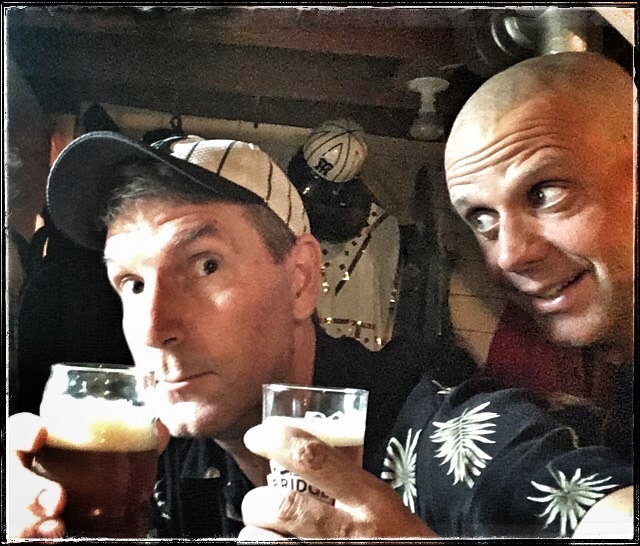 Robert’s Interviews – Robert: Pahoa, Hawaii, USA • Rob: Hillsdale, New Jersey, USA and the Estudio Busqueda de Pantomima in Guanajuato, Mexico. 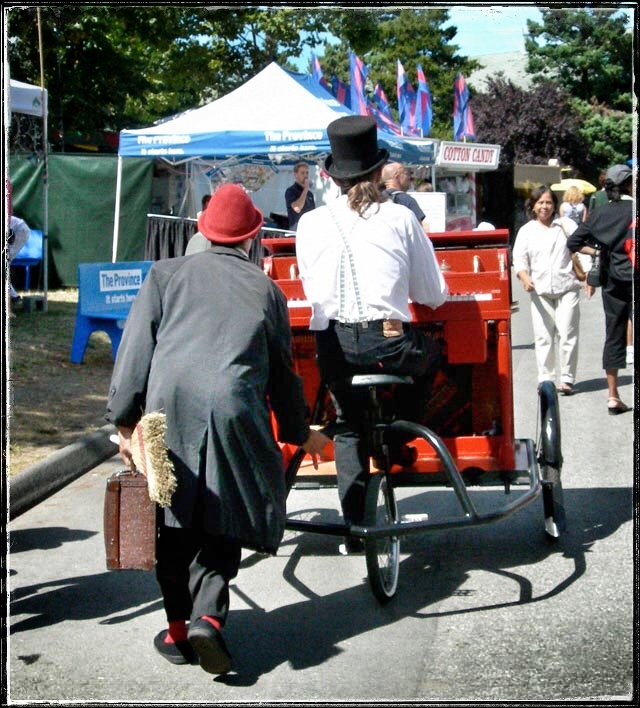 Preamble music: “When You And I Were Young Maggie Blues” as played by Hokum W Jeebs on his Piano ala Cart CD. Stories from the Pitch ‘Shorts’ Theme Music: “Vino” Royalty Free Jingle available in Apple Computers’ GarageBand. “Organordion Waltz” as played by Hokum W Jeebs on his Piano ala Cart CD. “Side by Side” as played by Hokum W Jeebs on his Piano ala Cart CD. “The Entertainer” as played by Hokum W Jeebs on his Piano ala Cart CD. “The Song Is Ended” as played by Hokum W Jeebs on his Piano ala Cart CD. Comments: On June 26, 2018 Rob Torres, The International Man of Mirth took his final bow on the stage of life. 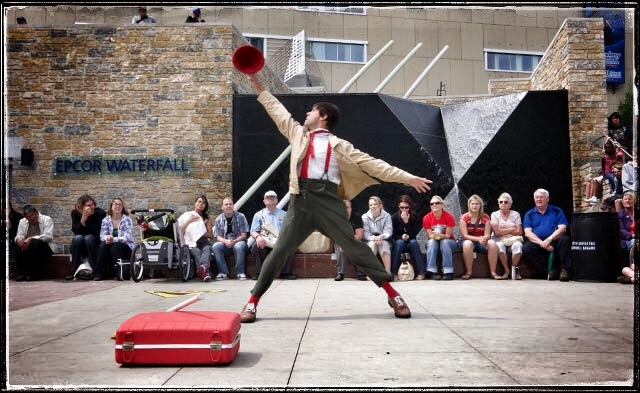 Rob Torres was the sort of creative soul who always sought out the most interesting narrative whenever he was performing, be it in Circus, on Stage or playing the Street. Inevitably that narrative would create tension then a release which came in the form of laughter. The result always seemed to be happy smiling faces in the wake of his performances. This pursuit of laughter, of Funeestuff that everyone in his audience could relate to guided the course of his career, from Ringling Clown College to Clyde Beatty Cole Bros. 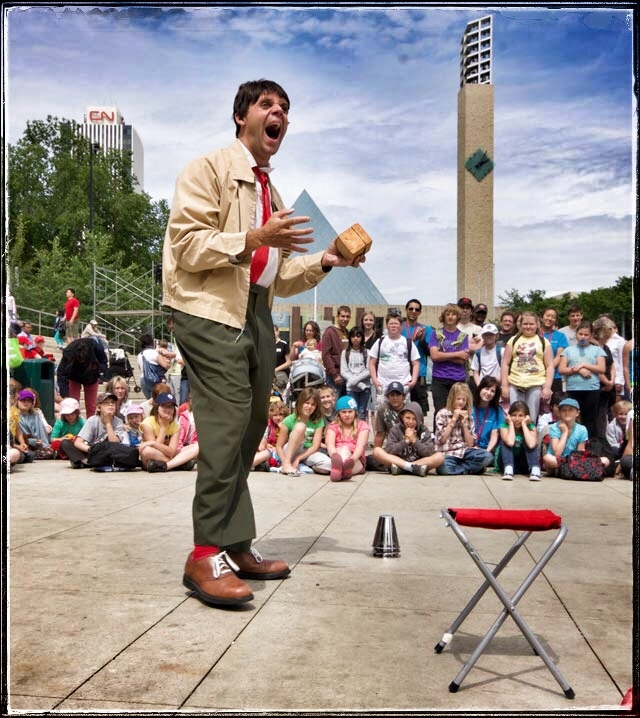 Circus to the International Festival Circuit to any venue that was enhanced through his innate ability to create laugh inspired joy for an audience. The Busker Hall of Fame was lucky enough to release two episodes of the Stories from the Pitch podcast which featured Rob. 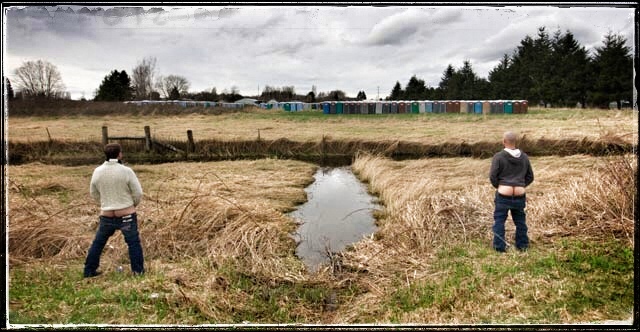 The first, a conversation with original founder of the B-HOF project, Robert Nelson, The Butterfly Man that was released on March 14, 2012, the second a chat he had with Magic Brian that was released on June 15, 2014. 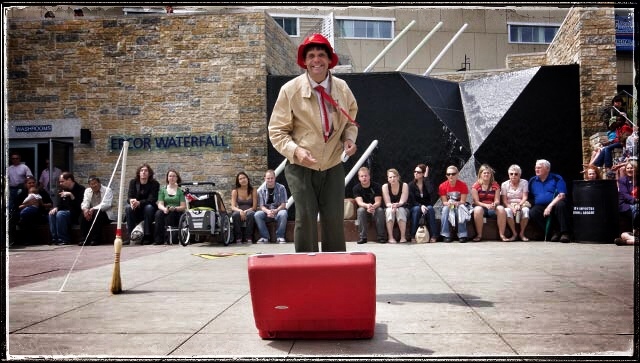 In honour of Rob being inducted into the Busker Hall of Fame by his colleagues and peers these two Rob-centric episodes are being re-releasing in tribute to the little clown who brought the world so much laughter. 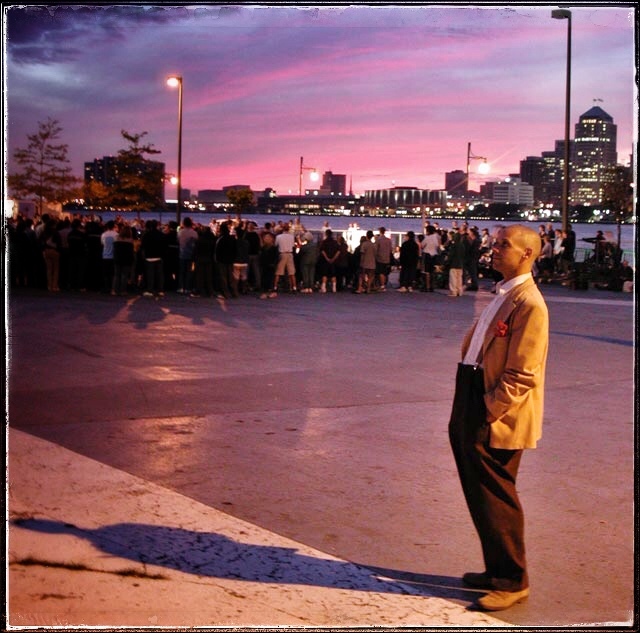 August 19, 2004 – I first met Rob Torres at the Windsor Buskers Festival and captured this shot of Rob against a brilliant sunset while we were kicking around between shows. 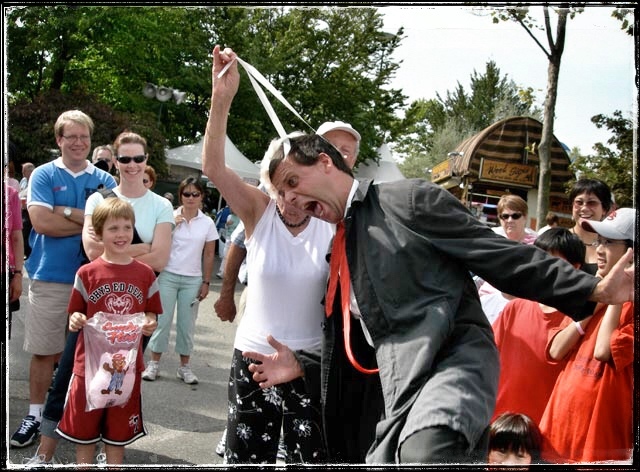 For 17 days during the 2005 Pacific National Exhibition, Rob teamed up with Hokum W. Jeebs to perform as ‘FuneeStuff’ to the delight of fair patrons and the tech crew who were often seen watching along with the rest of the crowd. 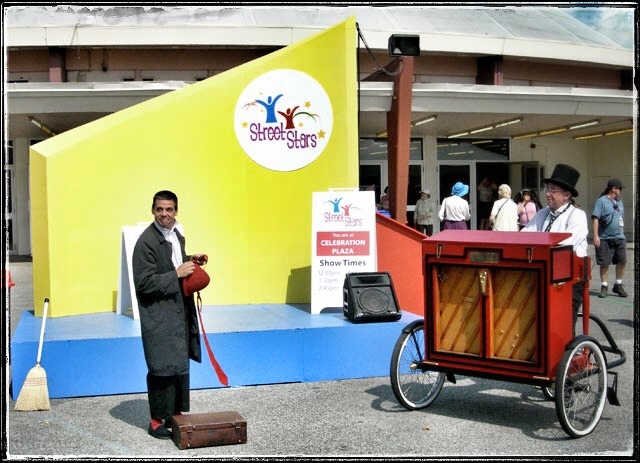 The PNE Street Stars program was a well loved addition to the fair! 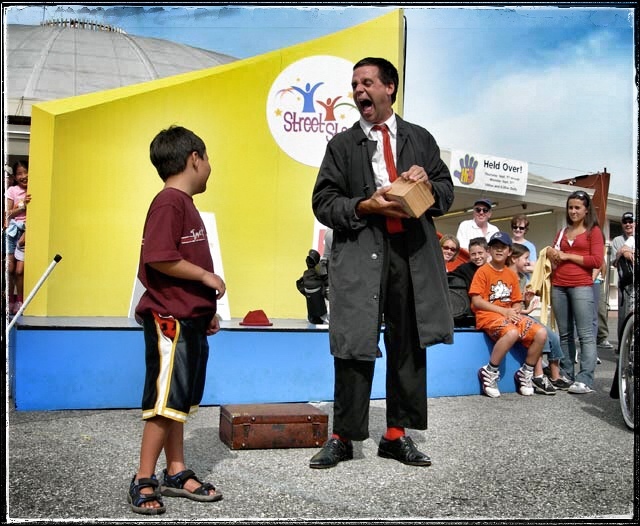 Who knew that so much applause, laughter and fun could be contained in a simple wooden box? Rob did! There is a theory in comedy that states that Pain = Funny. Rob was never shy of making himself the recipient of that pain if it meant a great laugh! This ‘reveal’ at the end of the show never failed to elicit a huge reaction from the crowd! Very sad that neither of these talented performers are with us any longer. 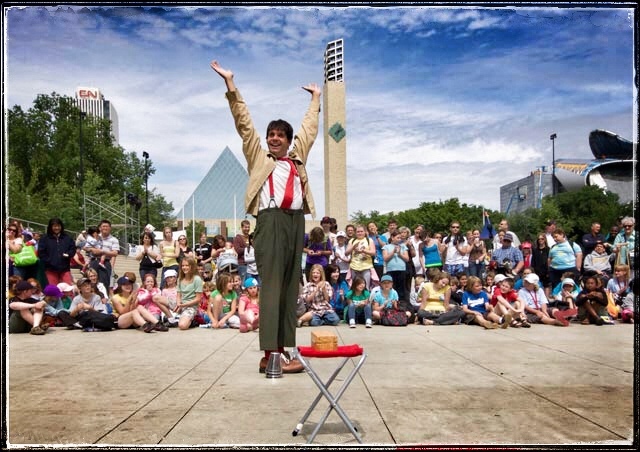 July 6, 2009 – I sat, watched and laughed as Rob Torres brought so much joy to the audiences of the Edmonton International Street Performer’s Festival! Though funny was Rob’s primary motivation, he actually has some mad-skills with prop manipulation! 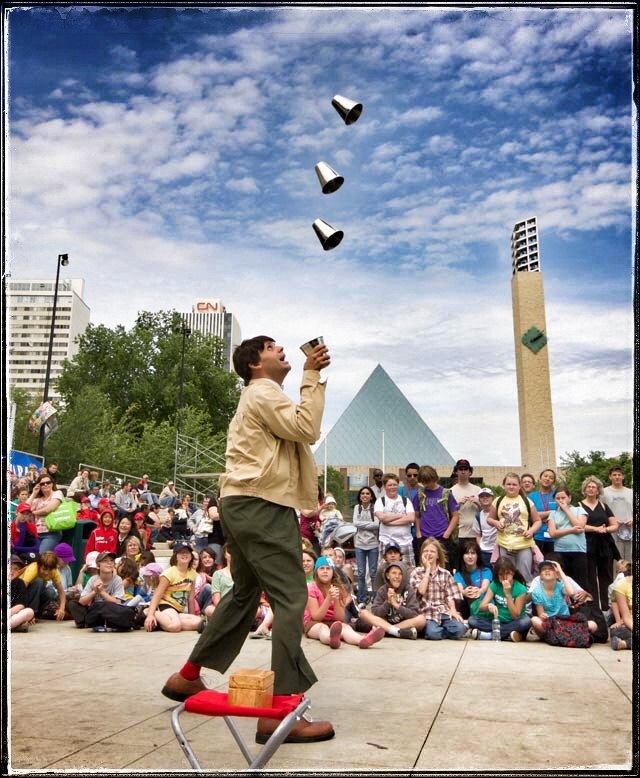 It often took multiple attempts, but when Rob landed this trick the crowd would erupt into a huge round of applause! Such joy in the shared experience of packing applause into a tiny little wooden box! Such satisfaction from the joyous exchange between performer and audience! March 17, 2011 – A little posed mischief on the way down to Moisture Festival in Seattle. After a few Checkerhead Brewing Ales, pants apparently seem highly over rated! 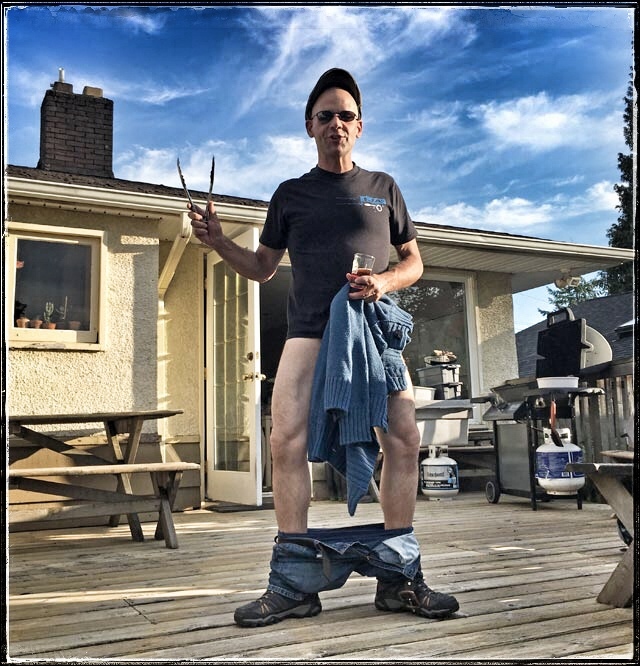 This entry was posted in Bio-Episode, Interview, Magic Brian, Robert Nelson, Stories, Street Performing. Bookmark the permalink.